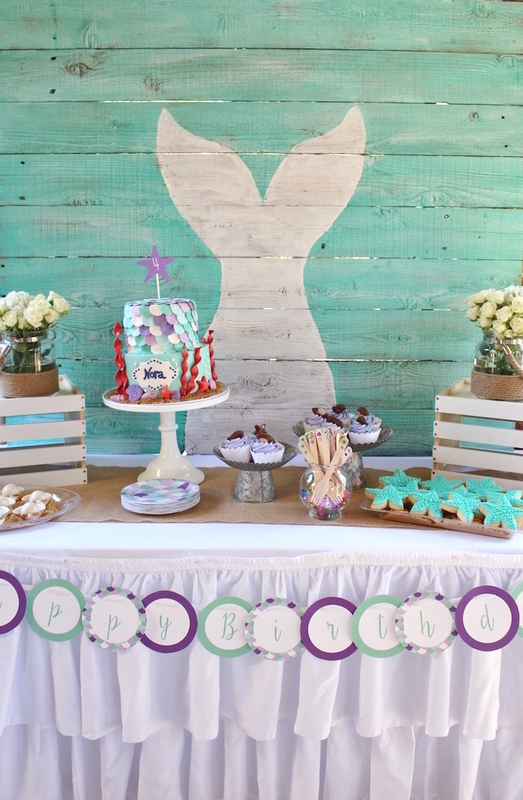 Swim on over to the deep blue sea, where this Miraculous Mermaid Birthday Party is waiting for thee! 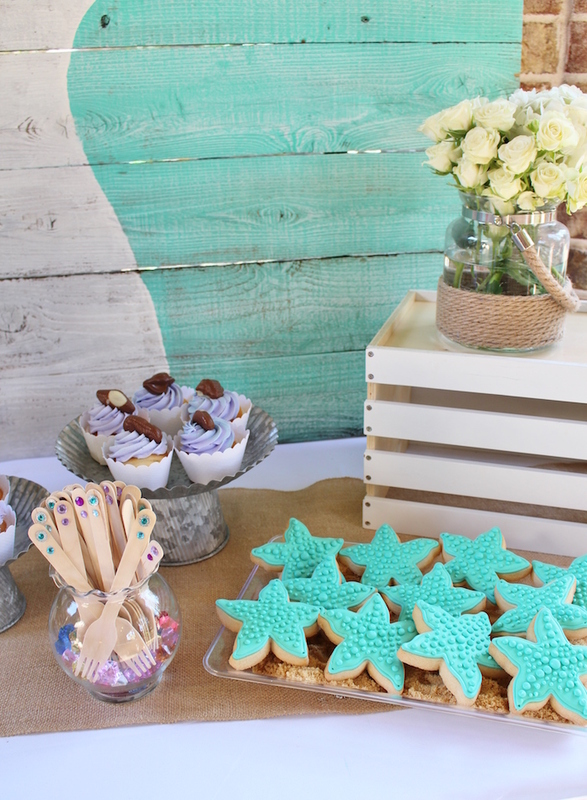 Filled with wonder and sea-worthy sweets; this “fin”-tastic birthday party by Julie Verville of Crowning Details, out of Houston, TX, is a real treat! 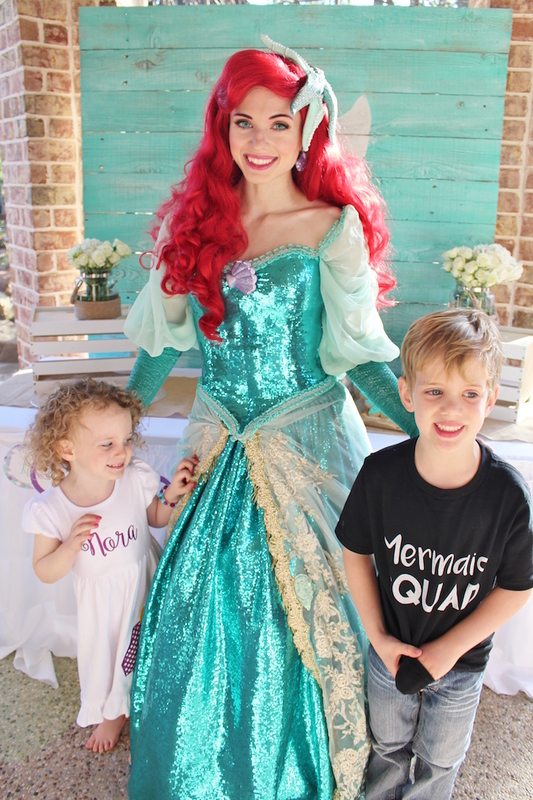 This is what Julie shared about the party- “Our little Nora was very clear about her chosen 4th birthday party theme….she wanted an Ariel party! So, we started working on a design that would incorporate Ariel herself, but with a different twist on the mermaid design. Our party’s design inspiration started with this double-sided invitation design, featuring a colorful mermaid tail design, soft blues and a nod to Ariel with red mermaid hair. 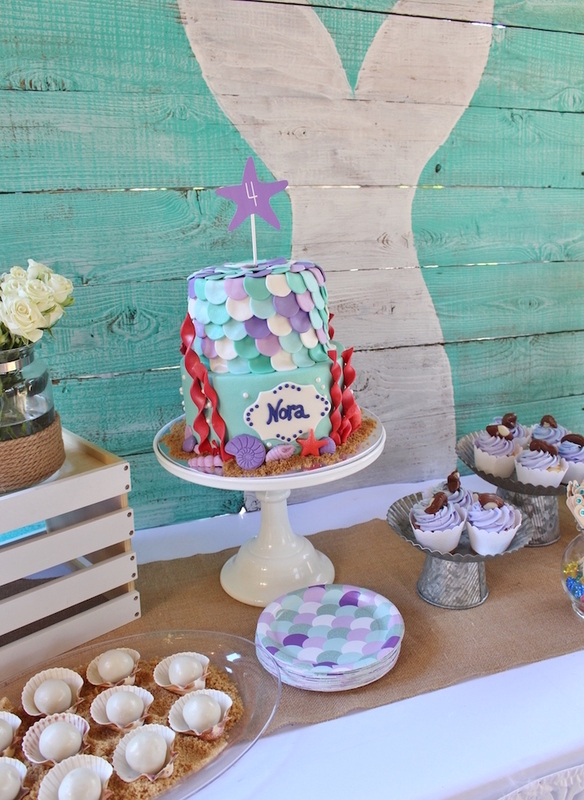 The focal point of Nora’s dessert table design was this distressed aqua board backdrop, created with wood planks, painted with a simple white mermaid tail. To pull through the white coloring and to add softness to the table, we chose this ruffled white table skirt. For added dimension across the table top, a burlap runner was used down the center of the table. 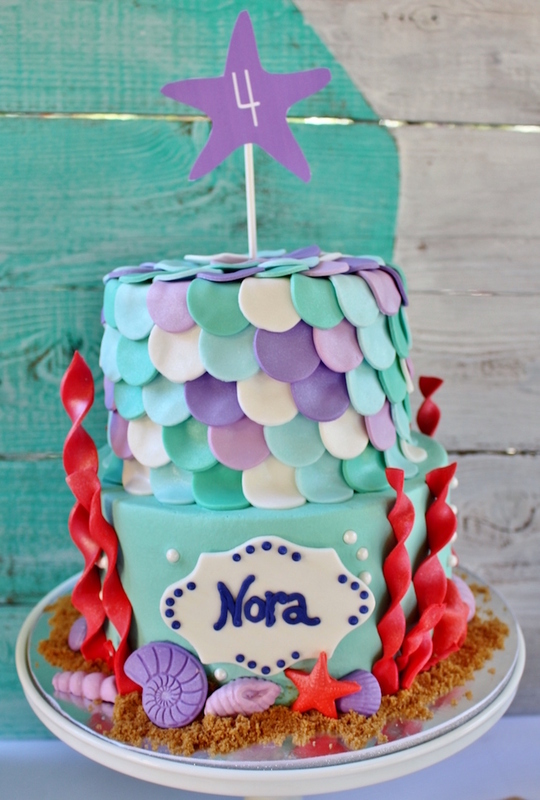 One of Nora’s biggest requests other than Ariel making an appearance at her party was a ‘big’ cake. 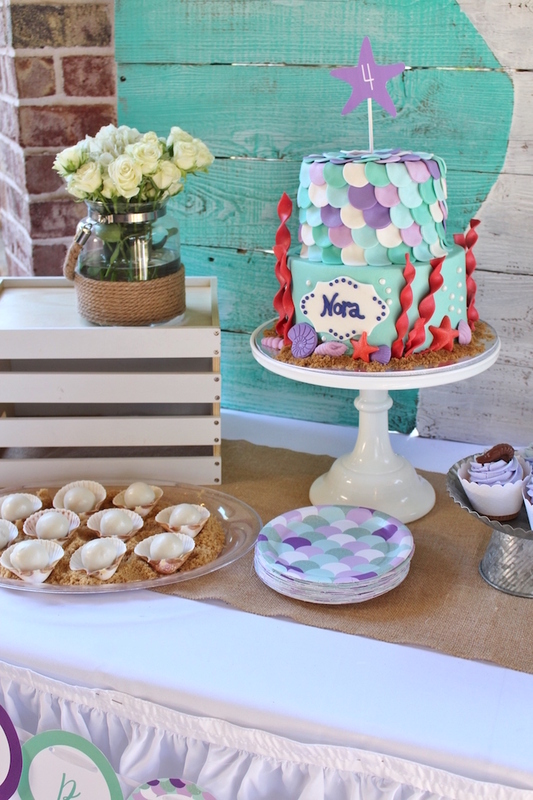 She loved her 2 tier cake featuring the same Mermaid tail scales from the invitation, a “4” paper topper from our printable collection, name plaque, and fondant accents. I always love to serve cupcakes at a preschool age party as they are easy to pass out to party guests! 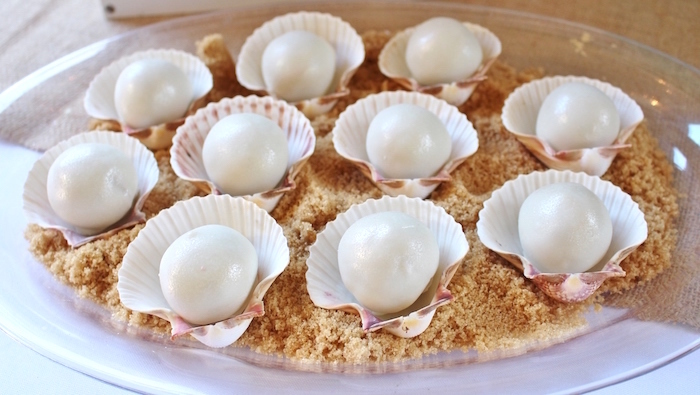 This year, we chose simple store bought cupcakes dressed up with white wrappers, light purple icing, and chocolate seashells. 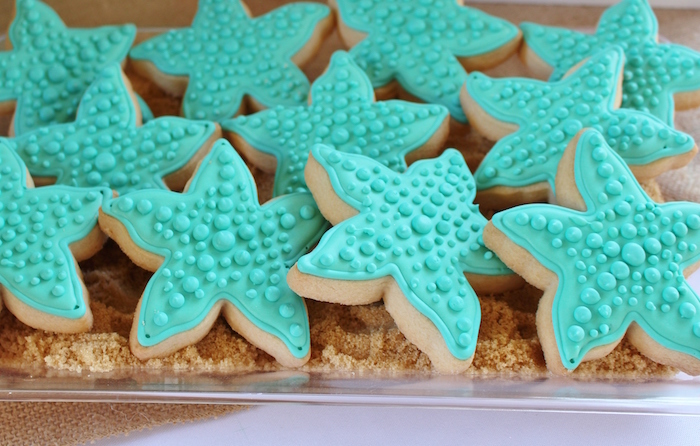 For adults, and well kids that love amazing sugar cookies, we displayed starfish cookies and pearl cake balls in sand, aka light brown sugar. 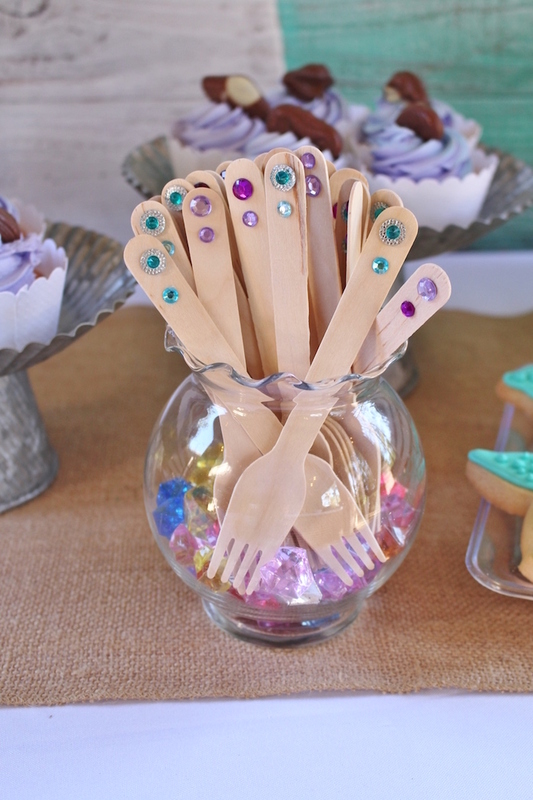 All of the desserts were served on our newest paper plates alongside wooden forks embellished with rhinestone stickers. 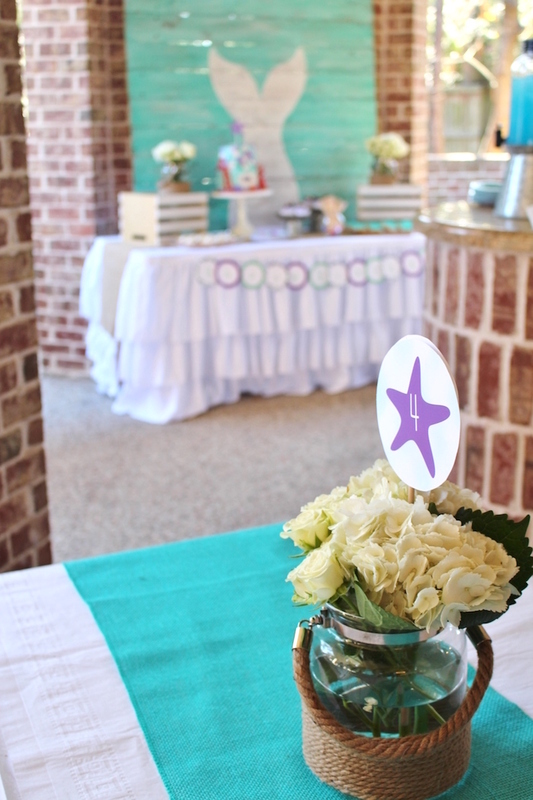 We kept seated tables very simple in design, choosing layered white paper tablecloths for easy after-party clean up, light blue burlap runners and nautical glass centerpieces filled with white flowers and personalized starfish paper toppers. 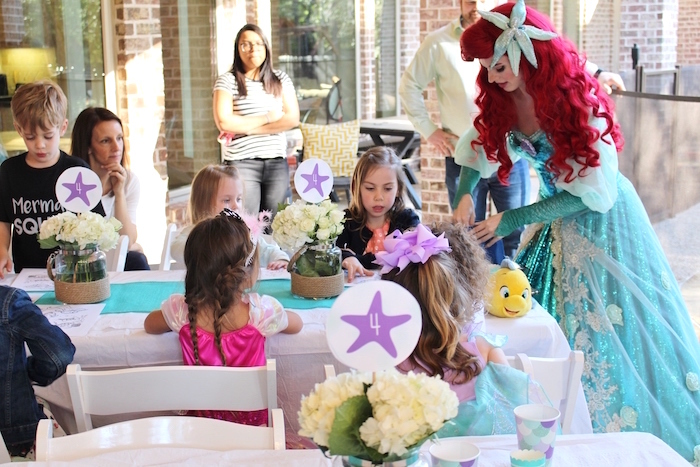 Party guests enjoyed an interactive experience with Ariel, complete with storytelling, coloring, games and photo ops. 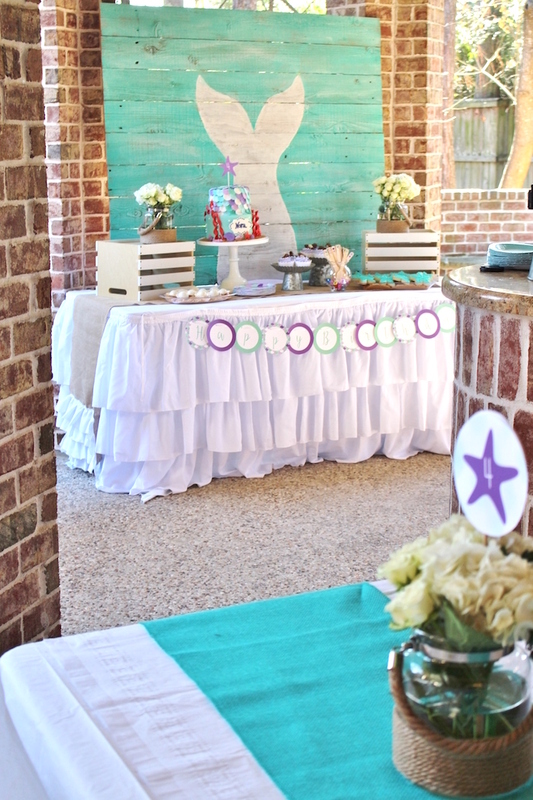 Guests also played in our life sized, personalized sand castle and general running around the backyard. 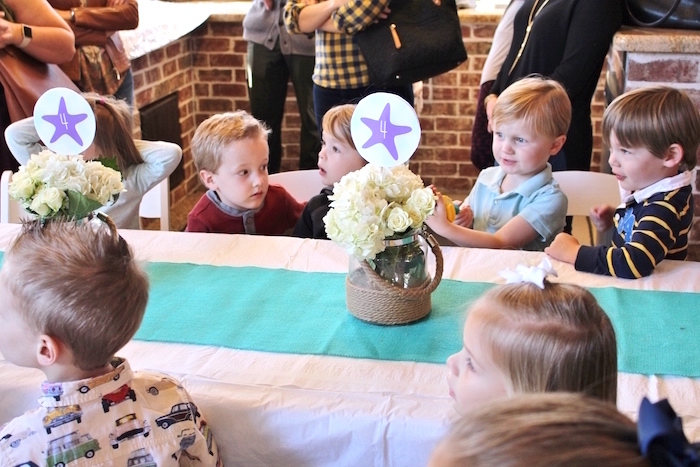 The birthday girl wore a custom mermaid dress, complete with blonde hair and a big “4”, while Nora’s two brothers sported “Mermaid Squad” t-shirts during the party The boys loved their shirts, as it made them feel included in the festivities! I couldn’t get daddy to agree to wear a MerDad shirt, although I tried :). 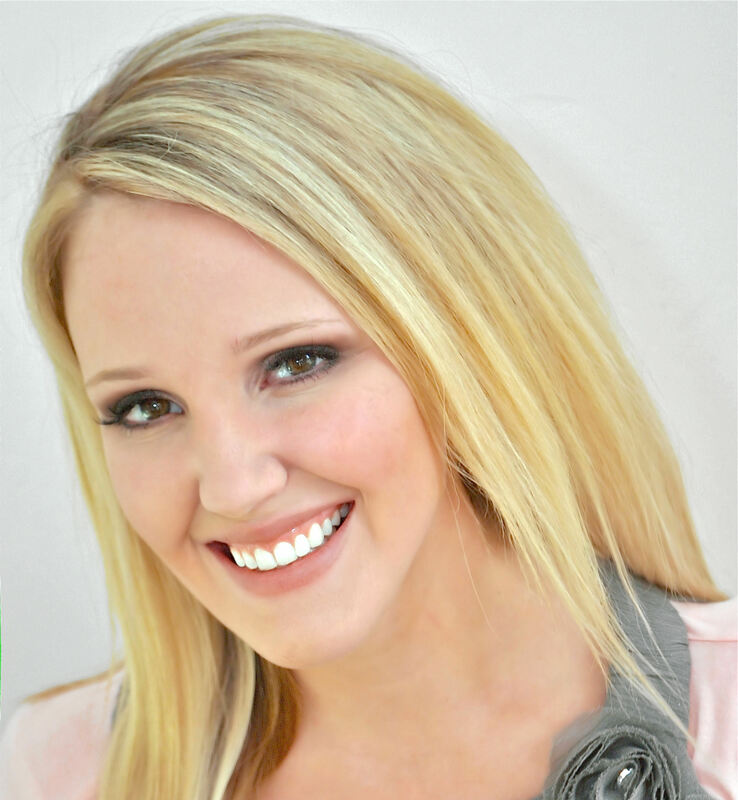 For party favors, the little girls took home bags full of seashell hair pins and beaded mermaid bracelets, while the little boys took home bags of personalized seashell crayons. Since we invited her entire class, I thought it was important to select favors that included both genders. I would say everyone had a magical time at Nora’s 4th birthday party”!